Presteigne St Andrews FC linked up with the town’s Little People’s Playgroup to stage a fundraising race night at the Football Club on Saturday 5 February 2011. The event was largely organised by Football Club committee member Dougie Preece and it was an unqualified success both in terms of the money raised and the fun had by those who were there. 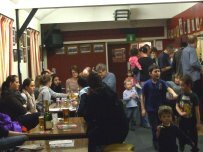 “It was a very successful evening as quite a few parents turned up with their children which was good as it was billed as a family night and a good evening was had by all,” said club chairman Alan Randell. “You make most of the money beforehand by selling the horses at £5.00 per go and we sold 186 horses. “Dougie sold a race to supporters down at the game on Saturday afternoon and it was a really nice evening,” he added. Alan felt that it was only fitting that the winning horse in the the selling race at the end of the evening went to the brains behind the evening. “Dougie won the £50.00 for when we auctioned a race at the end of the night which was only right as he put so much work into organising the evening,” he said. “But an initial calculation points to both organisations being about £520.00 better off as a result of the night, so it was a great success,” he added. The chairman was also keen to thank all of those committee members who had provided the refreshments for the evening, while he also thanked first-team manager Barry Williams and those players who did remain behind. “Your horses are still running – it is just coming down by the toilets at the Football Club now!” said Alan. “We are two or three days on from the event and your horses are just heading out on the second circuit now,” he added. The next time the RSPCA rattle a tin under my nose in Presteigne High Street, remind me to tell them that I have already donated money in support of sick animals….. Thanks to Alan and Paula Randell for supplying me with a couple of photographs from the evening – and well done again to Dougie Preece and his helpers for their organisation of what was clearly a very successful evening.